New Jersey Author Lo Anne Mayer Releases Her Controversial New Book 'Celestial Conversation' and States, "Conversing With The Dead, It's Never Too Late To Make Up." An estranged father and his son. Friends whose bond was broken by a misunderstanding. A soldier who killed during combat. Death can freeze relationships — and their unfinished business — for eternity. The result: loved ones living in a state of dismay, depression, even defeat. 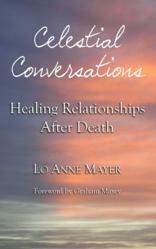 But Lo Anne Mayer, author of 'Celestial Conversations: Healing Relationships after Death,’ says it doesn't have to be that way. An estranged father and his son. Friends whose bond was broken by a misunderstanding. A soldier who killed during combat. Death can freeze relationships — and their unfinished business — for eternity. The result: loved ones living in a state of dismay, depression, even defeat. But Lo Anne Mayer, author of 'Celestial Conversations: Healing Relationships after Death,’ says it just doesn't have to be that way. The New Jersey-based author, who has led transpersonal journaling workshops for many years, has released a long-awaited book showing how this journaling has improved her life. 'Celestial Conversations: Healing Relationships after Death' tells the story of how Lo Anne turned a seemingly terrible relationship with her mother, which hadn’t been healed before her mother died, into a loving relationship in which each finally could open up to the other. Through journals mother and daughter could say how they really felt — regardless of the fact one of them was physically dead. According to the Centers for Disease Control and Prevention, 2.4 million citizens die in the U.S. each year. A staggering 19% of the population has lost a child, and nearly everybody experiences the loss of at least one parent. By themselves these statistics could make for grim reading, but the real problem comes into even clearer focus when one takes into account that most relationships are not perfect. This is an all-too-familiar situation, and death usually leaves no option for reconciliation. It stands resolute as the great divide between those who live and those who have passed on. All rifts, unhealed, simply endure. However, in 'Celestial Conversations: Healing Relationships after Death', Lo Anne explains that due to her transpersonal journaling experience, this was not the case for her. Lo Anne continues to help many people through her workshops across the U.S. 'Celestial Conversations' is endorsed by an impressively international array of medical, psychological, and spiritual authors, including Larry Dossey, Allan Botkin, Linda Drake, and Dianne Arcangel.